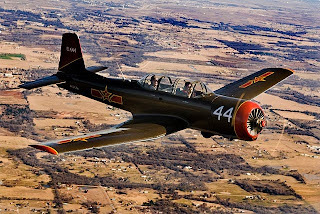 Jon and Miguel took the Cold War Air Museum CJ-6 out for some exercise last weekend. Jon needed to keep his formation skills current and Miguel needed an excuse to fly and take pictures. 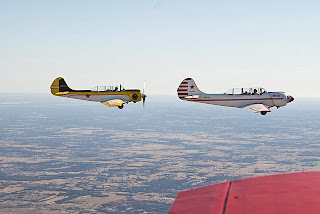 Yaks often fly with CJ's but there are some distinctive differences on view. The rounded tail is noticeable on the ground or in the air as different from the CJ's more squared tail. In flight the nose gear of the Yaks hangs lower and the main gear comes forward rather than folding into the wing as the CJ's does. No matter the differences, aircraft in flight are lovely to behold. 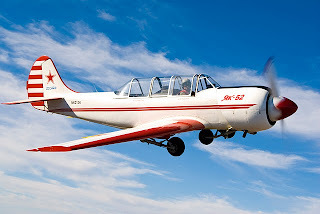 Miguell's picture of a red and white plane against a blue sky is beautiful and the colors are appropriate whether you think of them as belonging to its original home in Russia or its current home in the U.S. The Yaks in the exercise are seen here in formation. 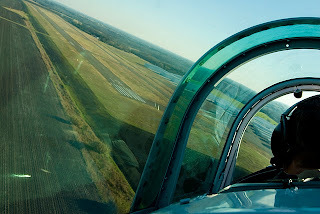 Our next post will feature more pictures and Jon talking about formation flying and the pilots and ships involved. Another well restored, painted and maintained CJ was part of this flight. We all look forward to the times we can fly together. No matter how much fun you are having, at the end of the day coming in for a landing is a welcome sight.